↑ Preliminary number of resident population in the Republic of Moldova as of January 1, 2012. National Bureau of Statistics of Moldova. February 8, 2012. http://www.statistica.md/newsview.php?l=en&idc=168&id=3670. Retrieved on 18 ਫ਼ਰਵਰੀ 2012. 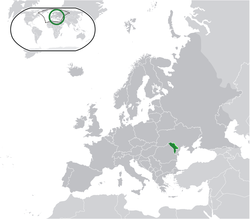 ↑ 5.0 5.1 5.2 5.3 "Moldova". International Monetary Fund. Retrieved 2012-04-19. ↑ "Human Development Report 2011" (PDF). United Nations. 2011. Retrieved 20 January 2012.